This page contains items previously found on the "OSSC News in Brief" section on the home page, along with the date it was first published. Topics and speakers from past meetings can be found here. Jim E. Yanes passed away on January 11, 2012. He was always a nature lover. Flowers and plants were his passion. Jim became involved with orchid societies from 2003 to 2009, first with the San Fernando Valley Orchid Society then with the Orchid Society of Southern California in Burbank. Jim had a hot house and grew all types of orchids. He was able to grow cymbidiums outdoors. He also loved to photograph his orchids. He was also an avid golfer and belonged to several golf organizations. He is truly missed by all his friends and love ones. Jim’s wife Mary Ann has generously donated Jim’s orchid collection to our society. The society truly appreciates this donation, and conveys its sympathy to Mary Ann for her loss. NEW YEAR, NEW ORGANIZATION: [Submitted by OSSC President Ted Augustyn] 2011 ushered in a new OSSC Executive Staff and Board Members. I congratulate and applaud those members that stepped into new responsibilities to help our society grow. Check out the OSSC Organization page for a complete listing of our society's officers and board members. Virginia M. (Giese) Dickey died on Sunday, November 21 of complications from surgery for lung cancer. She was 81 and lived a full and active life. Virginia was born and raised in Los Angeles. She received her undergraduate degree from the University of Southern California where she was a Homecoming Princess and a member of the Alpha Delta Pi sorority. Virginia graduated from the University of Southern California Law Center in 1952 where she had a distinguished record. She was on the Southern California Law Review and was the only woman in her law school class to graduate. Following graduation, Virginia worked as a research attorney for the Los Angeles Superior Court. In 1955 she married John W. Dickey, a fellow USC Law Center graduate. Virginia subsequently left law practice to raise her family. She found time to hone her skills in cooking, knitting, sewing and cake decoration. A lifelong resident of Southern California, she enjoyed travel to distant and exotic places. Virginia, her husband and her son Daniel shared a love of orchids. They raised many prize winning orchids and belonged to various southern California orchid societies. Virginia also loved long-haired dachshunds, beautifully designed clothes and all things Asian. She is survived by her daughters Dorothy and Denise, son Daniel, and granddaughter Deanna. Her daughters followed her (and their father's) footsteps and became lawyers while her son has carried on the family tradition of growing orchids. A memorial service will be held on Saturday, December 4 at 1 p.m. at Saint Patrick's Episcopal Church, 1 Church Rd., Thousand Oaks, CA 91362. In lieu of flowers, donations can be made to the Santa Monica College Foundation (1900 Pico Blvd., Santa Monica, CA 90405) or to the charity of your choice. IN MEMORIAM: [Submitted by OSSC Webmaster Ted Augustyn on November 30, 2010, acting on information from OSSC Member Norito Hasagawa] OSSC Past President and AOS Gold Medal recipient Leo Holguin passed away on November 19. Highly regarded as a hybridizer for Armacost and Royston (subsequently named Stewarts Orchids, where he worked with OSSC Past President Ernest Hetherington), and trained by the legendary orchidist B.O. Bracey, Leo was one of the first AOS judges in Southern California. He served as President of the OSSC in 1964 and 1965. In the words of AOS Past President Milton Carpenter, Leo was "truly the 'Gentle Giant’ of the Orchid World! Certainly we all wish to pay homage to the memory of this exceptional man and I know Ned (Nash) will pen just the right words for 'Orchids'. It was my great honor to present Leo with the AOS Gold Medal a few years back and I shall always remember that wonderful evening in California, (we tried so hard to keep it a secret and Leo was moved to tears)." Voting on this slate of candidates will occur at our Annual Holiday Party on December 13, 2010. IN MEMORIAM: [Submitted by OSSC Member Norito Hasegawa on March 22, 2010] Lloyd DeGarmo passed away on Feb. 22, 2010. He was 86. He served as an Orchid Digest Judge (no longer a judging system), a Cymbidium Society of America Judge, and an American Orchid Society Judge becoming an Emeritus Judge in the latter two judging systems which only very few judges ever attain in their lifetime! Lloyd was a retired librarian at the Compton Community College before retiring to Hawaii. An avid reader, he amassed a large orchid library which was eventually donated to the AOS. He was instrumental in editing the voluminous Proceedings of the World Orchid Conference held in Long Beach in 1966 sponsored by the Orchid Society of Southern California, introduced Cymbidium Peter Pan 'Greensleeves' when converted to a tetraploid became a very famous breeder of miniatures and novelties. Probably his most lasting fame will be the registration of the trigeneric Oncidium alliance hybrid genus Degarmoara in 1967 combining Brassia, Odontoglossom and Miltonia. OSSC can be proud to claim him as one of our own. OSSC MEMBER WINS BIG IN SANTA BARBARA: [Submitted by OSSC Webmaster Ted Augustyn on April 6, 2009]. OSSC member Art Mendoza came back from the 2009 Santa Barbara International Orchid Show with a trio of plaques, listed below. Way to grow, Art! NEW FEATURE ON WEBSITE: [Submitted by OSSC Webmaster Ted Augustyn on May 15, 2009] I've added a new page to this website called "Orchids We Grow" that features all those wonderful photos found in the OSSC flickr group, showcasing the most "interesting" photos up front. Be sure to check out these beautiful photos taken by Southern California orchid enthusiasts. My thanks goes to OSSC Publicity Chair Carlos Cruz for the code that accesses the flickr API that makes the page possible. OSSC FLICKR PHOTO CONTEST WINNER! [Submitted by OSSC Publicity Chair Carlos Cruz on July 3, 2009] Congratulations to Alfred Hockenmaier! He is the winner of the OSSC Spring 2009 Flickr Photo Contest. Second place went to Charles Boco, and third place went to Jane Auerbach. Thanks to all the people who participated in the contest. To see some of the other outstanding contest entries, please visit this page. NEW FLICKR PHOTO CONTEST ANNOUNCED: [Submitted by OSSC Publicity Chair Carlos Cruz on March 24, 2009] Members of the Orchid Society of Southern California are formally invited to participate in a flickr orchid photo contest. The primary goal of this contest is to promote our society by displaying our orchid photos on the most popular photo sharing website. The secondary goal is to share our orchid photos with each other. Only photos uploaded during the contest can be entered. To enter this contest you must be a member of the OSSC. You can only enter photos that you have taken. Orchid photos do not have to be of your own orchid. Photos should be relevant to orchids and/or the orchid society. The 1st place winner will have first choice, the 2nd place winner will have second choice and the 3rd place winner will have third choice. The contest will start on April 20, 2009. The contest will end on June 20, 2009. Create a free flickr account and upload your orchid related photos once the contest has started. When you upload the photo, tag it with "OSSCSpring09". Tags can also be added at any time after the photo has been uploaded. To increase the amount of views your photos receive be sure to include as many other relevant tags that you can think of. You can add up to 75 tags per photo. Feel free to contact me if you have any questions about using flickr! OSSC FLICKR PHOTO CONTEST WINNER ANNOUNCED: [Submitted by OSSC Publicity Chair Carlos Cruz on February 12, 2009] Congratulations to Charles Boco! He is the winner of the first OSSC Flickr Photo Contest. Here is one of his beautiful photos: Encyclia mariae. Please visit his Flickr page to see more of his wonderful photos. Thanks to all the people who participated in the contest. To see some of the outstanding entries please visit this page. If you would like to participate in the next contest please sign up to flickr (it's free!) and join the OSSC group…http://flickr.com/groups/ossc/ If you have any orchid related questions please post them in the group forums and I’m sure one of our resident orchid experts will be happy to help answer your question. IN MEMORIUM: [Submitted by OSSC member Margot Thomas on January 13, 2009] OSSC member Sam Thomas passed away December 22, 2008. He was a sweet and kind man with a loving heart filled with curiosity and knowledge. Sam was a man with both wit and humor and a fascinating conversationalist. His insights and his overview of this world were remarkable. He will be missed. IN MEMORIUM: [Submitted by OSSC member Art Pollyea on January 5, 2009] It is with great sadness that we must report to you the death of long-time member, stalwart supporter of the OSSC, and Golden Circle recipient, Diola Snell. Diola died at home of natural causes on Saturday in a hospital bed placed in front of the fireplace in her living room. At her request there will be no funeral or memorial service. Diola, along with her husband Paul, authored several monographs on orchid culture. Her hothouse was the "gem" of her property, and it was quite an honor to be invited to view her collection. Although failing health kept Diola from attending OSSC meetings the last 3 or 4 years, she was still available to make phone calls on behalf of our various activities. Whenever asked she always contributed plants from her hothouse for orchid shows and exhibits. In her "younger years" (her 60's and 70's) Diola wouldn't miss an OSCC meeting, except when she was on a freighter destined for exotic ports of call. She always took stacks of reading material and, of course, the requisite amount of vodka for her evening libations. We are sure that those who knew her would agree that orchid world has lost one of its greatest supporters. Many thanks to outgoing officers (Krystine Chaparro, Marie Maize, Kay Van Eps) and outgoing board members (Susan Roberts, Harry Sinanian, Maria Yee) for the tremendous job they have done for the last two years. And congratulations to all of OSSC’s newly elected executives and board members. We look forward to great work from all of you! TEMPERATURE COMPARISON CHART AVAILABLE: [Submitted by OSSC Publicity Chair Carlos Cruz on December 24, 2008] Understanding an orchid’s temperature requirements is important to its successful cultivation. With that in mind, I just finished developing a temperature comparison chart webpage that will create a chart that compares the average temperatures of an orchid grower’s location to that of an orchid’s native habitat. You are invited to check it out! IN MEMORIAM: [Submitted by OSSC Member and AOS Judge Norito Hasegawa on June 22, 2008] Clark Day Jr., one of the original charter members of OSSC, passed away early June 2008 after relocating to Texas approximately two years ago with his wife Grace. (The last remaining charter member to our knowledge is Glen Hiatt). Clark was one of the most gracious commercial people of his time, sharing much of his knowledge with hobbyists, especially cultural aspects. Any plant with the cultivar name 'Cerritos' or 'Picardie' originated from his immaculate greenhouse located in Cerritos, CA. He is well known for his cymbidiums (a champion in the use Early Bird 'Pacific'), Cattleyas (received a rare FCC/AOS for Sophronitis coccinea) and his paphs such as Ali Taba, a re-make of St. Ouens Bay and Cerritos. He received an FCC/AOS for an albinistic P. micrenthum 'Picardie'. Mr. Day was 90 years old. We extend our sympathies to his wife Grace and his daughters. OSSC DONATES TO OCA [Submitted on 4/19/08 by OSSC President Krystine Chaparro] With the world population growing and needing more of the land, we need to set aside parcels of land to continue to grow and flourish in the same way it always has before us and after us for all time, and this is what the Orchid Conservation Alliance (OCA) is setting out to do. Dr. Peter Tobias, a Director of the OCA, came to our Monday night meeting to speak and point out the habitats that have been set aside so far and the good things the OCA has been funding. And this is why I am glad we, the Orchid Society of Southern California, presented Dr. Tobias with a donation of $1000 to the OCA, the largest donation from an orchid society to date. Additionally, OSSC Past President Alfred Hockenmaier presented Peter donations from several OSSC members. Might I say Peter Tobias was impressed? I’m proud we are conservation-wise. Our donation is a small price to pay for us to help the world save the birds, wildlife and why we attend our Monday meetings, the orchids. [December 2007] Elsie Hetherington passed away on December 11, 2007. She was the wife of OSSC Past President Ernest Hetherington. Both are members of the Golden Circle Honorary Board of the Orchid Society of Southern California. Elsie was a designer at The Annual Pasadena Showcase House for more than 20 years. She featured her orchids and cymbidiums in her displays. Our condolences go out to Ernest Hetherington and family. [November 2007] Two new OSSC officers have been elected by the Board to replace outgoing officers. First, Ralph Keating is taking over as Newsletter Editor from long-time editor Rita Desilets. In her tenure as Editor, Rita managed to considerably enhance both the look and content of our monthly newsletter with numerous innovations. We thank her for her superior years of service in this position, and commend Ralph for stepping into this position. Next, Norma Skinner has been elected to be our next Treasurer, replacing Susan Roberts. Norma's experience in bookkeeping makes her a natural for this position! OSSC wishes to thank Susan for her service as Treasurer this year. [August 2007] OSSC Past President (1966-67) and Golden Circle Honorary Board Member Gene Boyd died August 1, 2007. He was 93. Gene was an avid orchid grower for over 40 years and a respected orchid judge. He was awarded the honorary status of Judge Emeritus by the American Orchid Society in 1999. In 2000 he donated his orchid collection (1,657 plants) to the Huntington Botanical Gardens in San Marino. Blooming plants from his collection are regularly on display in the Huntington conservatory. Our condolences go out to his family and friends. [June 2007] Jean Luey Campbell passed away on June 14th, 2007. She was a member of the OSSC for many years and served on the Board as Membership Chair from 1994-1998. Our condolences go out to her husband Ian Campbell a along with family and friends. [June 2007] OSSC is pleased to announce that we have new Hospitality Chairperson: Ralph Keating, and assisting him is Norma Skinner. Ralph and Norma will replace Kathleen Dupree, who has done a great job of our refreshment table each month. Her efforts are greatly appreciated. [February 2007] The OSSC welcomes Susan Roberts as our new Treasurer, having been elected by the OSSC board at the April board meeting. Susan replaces Astrid Ferency, who has done a great job of managing our finances for the last three years. Her efforts are greatly appreciated! All other executive staff positions will remain filled as before. We congratulate those elected on their decision to become a more active part of the society, and look forward to working with them to realize our shared goals. And we recognize the service provided in the most recent term by the outgoing executive staff and board members. Thank you all! [May 2006]Sincere congratulations go to our newest Golden Circle Honorary Board inductees, Dan Dickey and Alfred Hockenmaier.&. It's been over 6 years since OSSC has added anyone to this very exclusive cadre of distinguished OSSC members. Both Dan and Alfred are long-time members of OSSC, and both have served as president and in other offices of the society. They have made, and continue to make, a tremendous contribution to furthering OSSC, and are always happy to share their considerable knowledge of orchids with other members. When the OSSC board approached the question of who was deserving of this special recognition, Dan and Alfred were the immediate and only choices considered, such have been significance of their contributions. OSSC is honored to have had the benefit of their dedicated service, and looks forward to their continued participation. [January 2005][Note from the OSSC Webmaster] It is with regret that I must shut down our orchid discussion board, as it has been swamped with WAY off topic postings coming from automated posting bots, some intruding from as far as China. I'll be looking into revamping the board with bot-proof technology in the future. [Note from the October 2005 OSSC Board Meeting] It's been over five years since OSSC needed to institute an increase in member dues. Since then, our annual costs have increased over $7.25 per member, largely due to a 67% increase in hall rental and liability insurance and a 28% increase in postage rates. Accordingly, the OSSC board unanimously voted an increase in annual membership dues from $20 per year per household to $25 to partially cover this shortfall. The "half-year" dues, for those members joining from July through October, will go from $10 to $12.50. • Electronic newsletter recipients will get access to the newsletter significantly earlier than those receiving it by surface mail. • Electronic newsletter recipients will get to experience the newsletter in COLOR, while the mailed version will continue to be black and white. And orchids ARE colorful! • By distributing the newsletter via the Internet, OSSC saves the cost of printing and mailing the newsletter. Currently, almost 2/3 of OSSC newsletter recipients have email addresses. Converting these to electronic delivery will save over $1200 per year, which is money we can use for things like more international (= higher cost) speakers. • And the environment wins because we save a few trees! [February 2004] It is with tremendous sadness that we report the passing of OSSC Treasurer Ronald Alvert Smith, who died the evening of February 29, 2004 at a local hospice of a brain aneurism, after being hospitalized on February 3 for a stroke. While he raised a broad selection of orchids, he is perhaps best known for his cultivation of Cattleyas. Ron brought a quiet sense of enthusiasm for orchids to our society, along with a wonderfully dry but infectious British sense of humor. And he was always happy to share divisions from his collection with other OSSC members. WeWe will all miss Ron’s kindness, his self-deprecating wit, and his selfless contributions to our society. Perhaps most of all, we’ll miss his puckish attitude and ever-watchful eye on OSSC expenses. Ron is survived by his widow, Sheila. He requested that his body be cremated, and Sheila will be returning his ashes to his native Great Britain at an unspecified time in the future. No services are scheduled. [January 2004] OSSC congratulates the newly elected members of the society's Board of Directors: Krystine Chapparo, Kathleen Dupree, and Norm Franzle. In addition, Art Mendoza was elected to serve the remaining two years of Sandra Sinanian's board term, as she has been elected our new Recording Secretary. We look forward to this injection of "new blood" into the society's board. OSSC would also like to acknowledge the contributions made in the past years by outgoing board members Alfred Hockenmaier, Joe Herbert, and Herb Rohwer, and Recording Secretary Derek Kemp. The energy and devotion you showed toward the society is very much appreciated! [January 2004] One of the exciting new initiatives to come out of the OSSC January board meeting was the institution of a “Mentor Program”, whereby an inexperienced member can be paired up with a more experienced orchid grower who is also geographically close. We’ve already created a computer-generated map of the greater Los Angeles area showing the location of all OSSC members so that it will be easy to identify the closest member should a "newbie" need some orchid advice. [July 2003] The results of OSSC's Annual Auction have been tabulated, and we have set a new record for the society for both gross and net receipts. Profound thanks to everyone involved in this event, the success of which helps insure the financial viability of our society and allows us to continue to increase the quality of our programs and other efforts. A complete recap of this year's auction results can be found here. [May 2003] The contents of the OSSC Library are now searchable and browsable! Just go to the new Library page and check out the new search features that will enable you to easily find just the right items to help in your orchid endeavors. [April 2003] The Society recently added 14 new items to our Library, including books written by May's speaker, Bob Gordon. Click here to see a list of the new titles in the library. [March 2003] OSSC is sad to report that Jerry Rehfield, owner of Starbek Farms, noted orchid hybridizer, and long-time member of our society, passed away on February 17, 2003. Over the last 30 years, he was a regular and treasured lecturer at OSSC meetings. He is survived by his wife, Louella, son Mark, daughter Diana, and three grandchildren. Jerry was born in Glendale in 1926, ice skated with professional shows, including Frosty Frolics, and taught figure skating, notably at many of the movie studios during the heyday of orchestrated ice spectaculars. When he turned his attention to orchids, his early hybridizing efforts produced champion results in the Cattleya alliance, many of which were sold through Stewart's Orchids. Jerry eventually turned his focus to Odontoglossum hybrids, where he also made many valuable contributions. 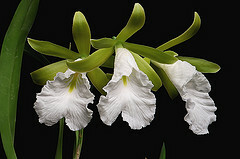 In 2000, in recognition of his efforts with Odontoglossum intergeneric hybridizing, the new genus Rehfieldara (Ada x Odm x Onc) was registered by his friend and fellow hybridizer Helmut Rohrl. A memorial service will be held on Saturday, April 5, 2003, starting at 1:00 PM at the First United Methodist Church, 305 East Anapamu Street, Santa Barbara, California. [May 2002] Also new to this site is the addition of the new American Orchid Society culture sheets. Click here to download and view them. [April 2002] The OSSC Library has grown by 10 new volumes, including authoritative reference books as well as cultural guides. Click here to see the complete list of new titles. [March 2002] OSSC is sad to report that on Monday, March 18th, one of its longest term members, Fordyce ‘Red’ Marsh passed away. Members who wish to do so are urged to make a donation to The Orchid Digest. See the President's Message for Dan Dickey's comments on Red's passing. [March 2002] Congratulations go to OSSC President Dan Dickey for winning 2 trophies at the 57th Annual Santa Barbara International Orchid Show. The Dickey Collection was named winner of Best Collection of 5 or More Cattleyas and Best Other Oncidium. Click here to see a picture of his display. Way to grow, Dan! [October 2001] OSSC's display of hundreds of beautiful orchids at the East West Orchid Show was a huge success! Thanks to all the volunteers who worked on it. See the article for full details.